Two loud explosions rip through the Thai seaside resort of Hua Hin hours after twin blasts killed one and wounded many others. HUA HIN (AFP, REUTERS, THE NATION/ASIA NEWS NETWORK) - A string of bomb attacks hit popular tourist towns across Thailand, leaving four dead and many injured, with authorities on Friday (Aug 12) ruling out terrorism despite suspicions that insurgents in the kingdom’s deep south are responsible. Four bombs exploded in the upscale resort of Hua Hin, about 200 km south of Bangkok on Thursday evening and Friday morning, killing two people and wounding at least 24. Other blasts hit the tourist island of Phuket, a resort town in Phang Nga province, and Surat Thani, a city that is the gateway to islands such as Koh Samui in Thailand’s Gulf. In the normally peaceful resort town of Hua Hin, blood-spattered tourists were given first aid by rescue workers as forensics teams picked through the rubble, with police in Bangkok scrambling to reassure visitors the situation was under control. There have been no reports of Singaporeans hurt in the incidents, the Republic's Ministry of Foreign Affairs said. No one has claimed responsibility for the 11 bombings, which killed four people and wounded several dozens, and the seemingly coordinated attack across five provinces does not match common patterns of violence in the turbulent nation currently under military rule. Thai police said the blasts were acts of local sabotage and were not linked to any international militant group. “This is not a terrorist attack. It is just local sabotage that is restricted to limited areas and provinces,” national police deputy spokesman Piyapan Pingmuang told reporters in Bangkok. “It is still unclear which group is behind the bombings,” the spokesman said, though he dismissed speculation that Muslim rebels waging a rebellion in Thailand’s far south were behind the recent attacks. National police chief Chakthip Chaijinda said they had intelligence an attack was imminent, but had no precise information on the location or timing. “We just didn’t know which day something would happen,” he said. Since Sunday’s referendum on the constitution, there have been attacks in seven provinces using improvised explosive devices and firebombs, Chakthip said. The devices were similar to those used by separatist insurgents in southern Thailand, but that did not conclusively show they were the perpetrators, he said. He said he personally believed it was related to the charter referendum because the attacks took place in the provinces that voted to approve the charter. "Those who had different opinions may do it to discredit the image of the country and hurt the tourism industry," he said. The Bangkok Post reported that police have detained two men for questioning, but there were no further details. Analysts said Muslim insurgent groups in the south could be behind the attack, but warned that coordinated bombings targeting tourists would mark an unprecedented escalation in a simmering conflict largely contained in the border region. The two blasts on Friday morning in Hua Hin came after twin explosions on Thursday. One of those was near a bar in a narrow alley in the town late on Thursday, killing one Thai woman and wounding 21 people. The two explosions in Hua Hin late on Thursday were detonated by a mobile device, police said. The first took place 20 minutes earlier and about 50 metres from the second, but injured nobody. They were followed by two more explosions on Friday morning that killed another person and left injured and bleeding people lying on pavements as emergency workers rushed to the scene. Another two blasts struck Friday at Patong Beach on the popular tourist island of Phuket while three more were reported further south – two in the southern town of Surat Thani, killing one, and one more blast in Trang, which also left one person dead. A Thai police spokesman said a total of 10 foreign tourists were wounded, including two Italians and one Austrian. Embassies in Bangkok said four Dutch and three Germans were also among the wounded. Britain and Australia reacted by advising their nationals to avoid public places, while Germany said further attacks may hit Thailand and advised visitors to show "extreme caution". Thailand’s southern tip has been home to a festering insurgency for over a decade, but the violence is largely contained to the border region, which lies far from the site of the recent bombings. Small bombings are common in the kingdom during periods of heightened political tension but there have been few such incidents in the past year and it is rare for tourists to be targeted. A police statement ordered officers across the country to “step up security at significant government offices and symbolic places, especially the bus terminals, train stations, and airports, tourist spots, restaurants, and entertainment places where a lot of people are gathering”. Hua Hin is home to the summer palace of Thailand’s revered royal family, and the first blasts came on the eve of Queen Sirikit’s 84th birthday. Junta chief Prayut Chan-o-cha called the bombings an attempt to trigger unrest in a country blighted by a decade-long political crisis. “The bombs are an attempt to create chaos and confusion,” Prayut told reporters in Bangkok. “Why have the bombs occurred as our country is heading towards stability, a better economy and tourism – and who did it? You have to find out,” he said. The first two bombs that went off in Hua Hin on Thursday were hidden in potted plants and exploded within 30 minutes of each other in the bar district of the popular beach town. “It was very shocking. There was a loud noise and police were running everywhere, it was terrible,” said Michael Edwards, an Australian tourist staying in a guest house close to where one of bombs detonated. “I was just surprised that it happened here... now I’m thinking if it’s worth staying,” he told AFP. Local media have reported several fires in southern provinces over the past 24 hours but it was not immediately clear if they were connected to the bombings. Hua Hin is popular with both local and foreign tourists and has for years been favoured as a retreat by King Bhumibol Adulyadej, the world’s longest reigning monarch. Germany says further attacks possible in Thailand after blasts, advisory urges "extreme caution"
The 88-year-old is currently hospitalised in Bangkok for a number of health issues, a source of anxiety for many Thais and a key factor in the kingdom’s past decade of political turmoil. 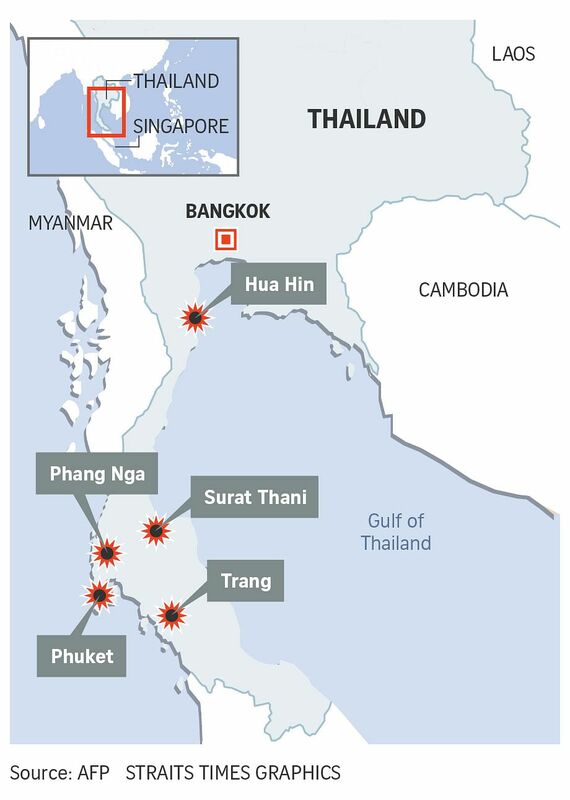 Due to the city’s royal connections, “the attack on Hua Hin seems like a direct affront at the Kingdom of Thailand”, said Paul Chambers, an expert on the Thai military. He added that “the culprits are most likely Malay-Muslim insurgent groups fighting the Thai state in the deep south”. Zachary Abuza, an expert on Southeast Asian militant groups, said that while the southern insurgents had not carried out coordinated attacks for years, it was possible “a small cell” was behind this assault. Thailand’s ultra-royalist military rulers, who seized power in 2014 after a decade of at times violent political unrest, have touted an increase in stability in the kingdom as a major accomplishment of their rule. The junta on Sunday saw its new version of the constitution approved in a referendum, although the three insurgency-hit provinces rejected the controversial statute. Thailand’s reputation as the “Land of Smiles” has suffered in recent years from political unrest and a number of high-profile crimes against foreigners. But tourists continue to flock to its white, sandy beaches. The kingdom is expecting a record 32 million visitors in 2016 – a bright spot in an otherwise lacklustre economy. The latest blasts came just days before the first anniversary of the last major attack on tourists in Thailand – an Aug 17 bomb that killed 20 people, mostly ethnic Chinese tourists at a crowded Hindu shrine in Bangkok. Two Uighur men from western China have been accused of the attack and are due to go on trial this month. Both have denied any involvement. Singapore strongly condemned the blasts. "We extend our deepest condolences to the bereaved families and wish the injured a speedy recovery," the Ministry of Foreign Affairs said in a statement. It said that it has contacted most of the registered Singaporeans in the affected areas and verified that they are safe and would continue to contact the remaining registered Singaporeans. There were no reports of Singaporeans directly affected by the attacks so far, the statement said. The ministry urged Singaporeans in Thailand to stay vigilant and take all necessary precautions for their personal safety, as well as e-Register with the Ministry of Foreign Affairs at https://eregister.mfa.gov.sg/. It also advised Singaporeans to stay in touch with their family and friends.